When women band together, they can break down barriers and build each other's confidences. We partnered with Athleta to share how the company is working with I Am Water to empower women and girls to brave the waters for the first time. Imagine diving more than 200 feet into the deep waters of the ocean on one single breath. That's what South African Hanli Prinsloo did when she secured one of her many records for freediving. For the uninitiated, freediving is a sport unlike any other. Athletes compete to see how far they can dive while holding their breath. Turns out, Hanli can go really deep. During her time as a freediver, she broke 11 South African records and became the first South African to hold all six free diving records at the same time. Not content with being a real-life mermaid, Hanli turned her love of water into a thriving nonprofit. Not content with being a real-life mermaid, Hanli turned her love of water into a thriving non-profit. In 2010, she founded the I AM WATER Ocean Conservation Trust, which is dedicated to protecting our oceans through education. Hanli believes a human disconnect from water fundamentally leads to ocean degradation and that exposing more people to the oceans will help both our environment and those who get to experience water's healing and empowering qualities. 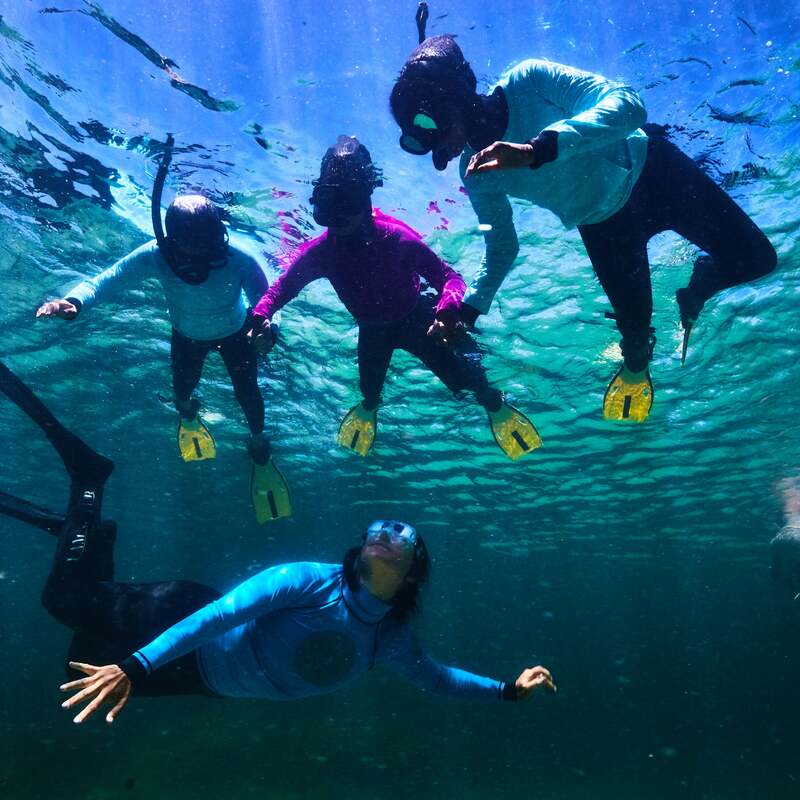 Working with freedivers and marine experts, I AM WATER provides memorable ocean experiences for underprivileged coastal communities, especially girls. Many times, it's the first time these girls have been in open water — and it changes how they see the ocean and themselves. Watch as Hanli shares her motivation for starting I AM WATER. Hanli Prinsloo channeled her freediving talent into a nonprofit that empowers young girls and helps save our oceans. Shop Hanli's look: Baja Bra Cup Bikini and Baja Notsostring Bottom. Since as far back as she can remember, Hanli loved swimming underwater. Unfortunately, she didn't live near the ocean. "Growing up on a horse farm wasn’t the best place for a little girl with mermaid dreams," Hanli tells us. Without access to the ocean, Hanli would go below the surface of her farm's dams and rivers. While attending university in Sweden, Hanli met a newly converted freediver who invited her into a small row boat and onto a vast fjord. "I took a deep breath at the surface and swam down to a rocky ledge on the side of the submerged cliff and just sat there listening to my heart rate slow down, my thoughts became less." She would go back to the fjord when the weather allowed and soon found herself traveling around the world for competitions. It takes focus, determination, and athletic ability to be a champion freediver. But that's where the similarities with other competitive sports may end. "In most competitive sports the athlete will psych herself up," explains Hanli, calling this practice a kind of adrenaline-fueled focus that leads to an explosive performance. "In competitive freediving it is all about getting into a really deep state of relaxation before the dive and trusting your own body to make the depth you have set." So how do you prepare to dive hundreds of feet underwater without psyching yourself up? Hanli says it's a slow process of proving to yourself that it's possible. "No matter how many coaches told me ‘you can go deeper’ or ‘you have more in you’ I couldn’t believe it until I proved it to myself." Every week and every month, Hanli would increase her depth and time, until she came to place of "that was easy, I think I can do more." Discovering her unlimited potential required patience and faith in herself — a recipe you can use to accomplish any goal, be it physical, personal, or professional. "In this slow and mindful way," Hanli explains, "I was able to achieve more than I thought possible and sustain these results still today." Knowing how freediving helped her reach new limits, Hanli created the I AM WATER foundation to help others break barriers by experiencing the oceans. Inspired by that mission, Athleta partnered with I AM WATER as part of The Power of She campaign celebrating active and confident women. 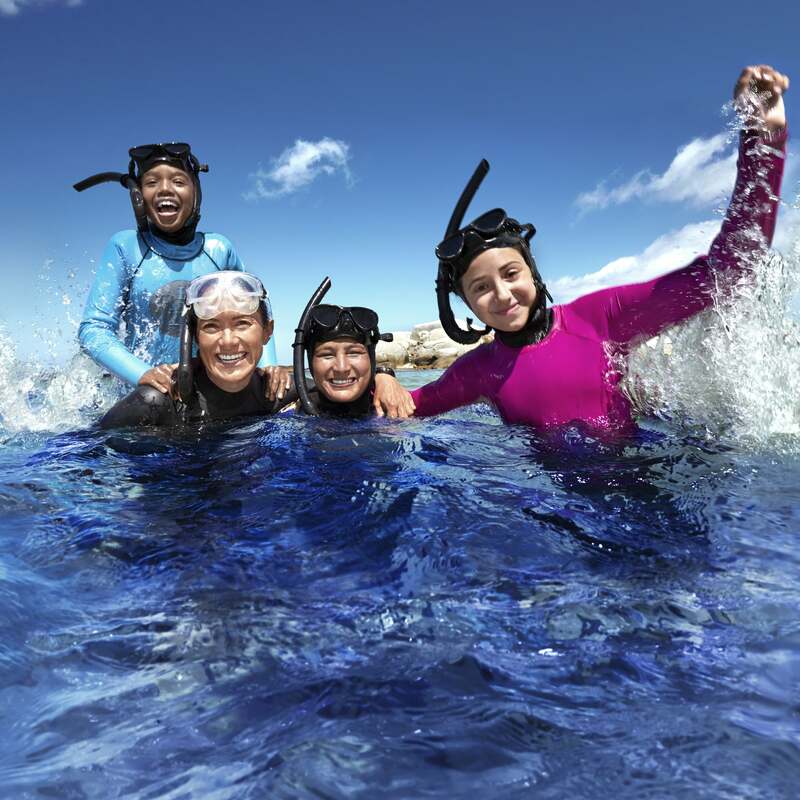 Athleta traveled to Cape Town, South Africa to weave the company's mission of sisterhood and empowerment into I Am Water's program enabling women and girls to literally swim outside their comfort zones and try something for the first time. Watch mother and daughter, Shireen and Gasina, overcome their fears of the water and find new strength. During that trip, the story of Shireen brought to life I AM WATER's mission. A native South African, Shireen grew up in a house where the ocean was feared, and she worried that she passed this fear on to her daughter, Gasina, now 11. Shireen’s husband was a good swimmer and encouraged Shireen to embrace the water. But even when she joined I AM WATER as the office manager, Shireen refused to go too far into the ocean. Shireen's husband predicted that 2017 would be their year — and she hoped this meant she would finally conquer her fear. Then he died suddenly, and she felt the weight of raising two children alone. Inspired by her late husband's hopes, she decided it was time to take on the challenge and see the ocean as an opportunity instead of a boundary. Through the I AM WATER program, both Shireen and her daughter, Gasina, finally experienced the ocean in a positive way — and Shireen was able to overcome her fear and feel new strength and determination to overcome life's other challenges. Through the I AM WATER program, Shireen was able to overcome her fear and feel new strength and determination. Considering her love of the ocean, it pained Hanli to realize many people like Shireen cannot or will not access it. During her years as a competitive freediver, her travels uncovered a sad reality: "In many of the countries I visited, from my own South Africa to the Maldives, Ecuador, Mozambique, and even the US, I saw a certain demographic enjoying the beach and getting to see what is below the surface of the ocean." But the less fortunate were shut out. "With so many millions of people completely disconnected from their blue backyard how can we ever hope to live in a world where our ocean is protected and where people feel a connection to this wilderness?" In order to bridge that gap, Hanli started I AM WATER. I AM WATER uses the principles of freediving to help young people connect with the ocean. Check out Athleta’s summer swim new arrivals for women and girls. The work of I AM WATER includes building awareness for our oceans by sending experts to speak in classrooms and at conferences. They also advocate for the oceans by engaging in global policy and legislation discussion about the environment. But the ocean experiences, like the one Shireen and Gasina participated in, may be the most essential part of their work. The organization works in South Africa, Mozambique, and Bermuda to introduce disadvantaged children to their nearby oceans. Despite living close by, many have never been underwater. In Mozambique, for example, I AM WATER partnered with an orphanage to take children swimming and snorkeling in the waves right outside their doors. I AM WATER has found success empowering girls. "The work we have done with girls from the townships around Cape Town and Durban has been remarkable," Hanli says. Thanks to the organization, girls who have never been to the beach or submerged in water have been able to shift their perception of themselves. By challenging some of their deepest fears and exploring the ocean, she finds they have new ideas about what life has to offer. Hanli says the program starts with with deep relaxation, yoga, and breathwork, to help participants slow down thoughts and strip away limiting assumptions and expectations. "Being more comfortable in their bodies, girls get to be more relaxed, more themselves." Watch as girls experience the ocean for the first time with I AM WATER. Hanli believes the teaching girls about the human body's remarkable adaptation to water, the incredible creatures that live in the sea, and how we are related to them opens a new sense of awe and inspiration and trust in their own abilities. After that preparation, the girls will finally put on a mask and fins and open their eyes underwater for the first time. Many of the participants are having an experience they thought was reserved for others. Here's how Hanli describes the transformation she witnesses: "We see girls standing up straighter, speaking up for themselves, daring to dream a little bigger. If I can do this, I can do anything." What surprises people the most when they finally connect with the ocean? How much they love it. "Oftentimes there is such a great fear connected to being in the ocean, that when someone has that first moment in water, there is a deep sense of 'why haven’t I done this before!'" Even many non-swimmers experience a feeling of coming home. "We see girls standing up straighter, speaking up for themselves, daring to dream a little bigger." The powerful benefits of water may be to thank for that. "The research done on the effect of water and the ocean on humans is fascinating," says Hanli. In the book, Blue Mind, marine biologist Wallace J. Nichols discusses the neurological, psychological, and emotional changes our bodies undergo when we're near water. "Time and time again," Nichols writes, "researchers have discovered that proximity to water strengthens the positive effects that environment has upon well-being." Hanli is familiar with the research. She explains that since our brains are constantly fed new information, being close to a big body of water allows our minds a chance to experience something very predictable — the constant movement of the water and waves. This makes our brains slow down and we feel calmer. Being submerged adds a whole new level to this with regards to weightlessness, stillness, and being present. "I’ve experienced all of this," Hanli says, "and always feel like I am a better version of myself in or near the water." Still barriers prevent many women and girls from connecting with the water. Many like Shireen grow up in households where the ocean is feared, and Hanli believes gender roles around the outdoors and adventure also limit many. "The boys are encouraged to be daring, try new things and explore, while the girls are held back, taught to be fearful and careful and limited in various ways." In underserved communities, Hanli says many girls are expected to help around the house while boys go out to play. "Taking care of younger siblings, cooking, fetching water — all of these things will be expected of a young girl more than boys." I AM WATER helps girls expand their belief of what is possible. Check out Athleta’s summer swim new arrivals for women and girls. As a freediving champion, Hanli accomplished great things as an individual. But she has been able to thrive thanks to the I AM WATER community. 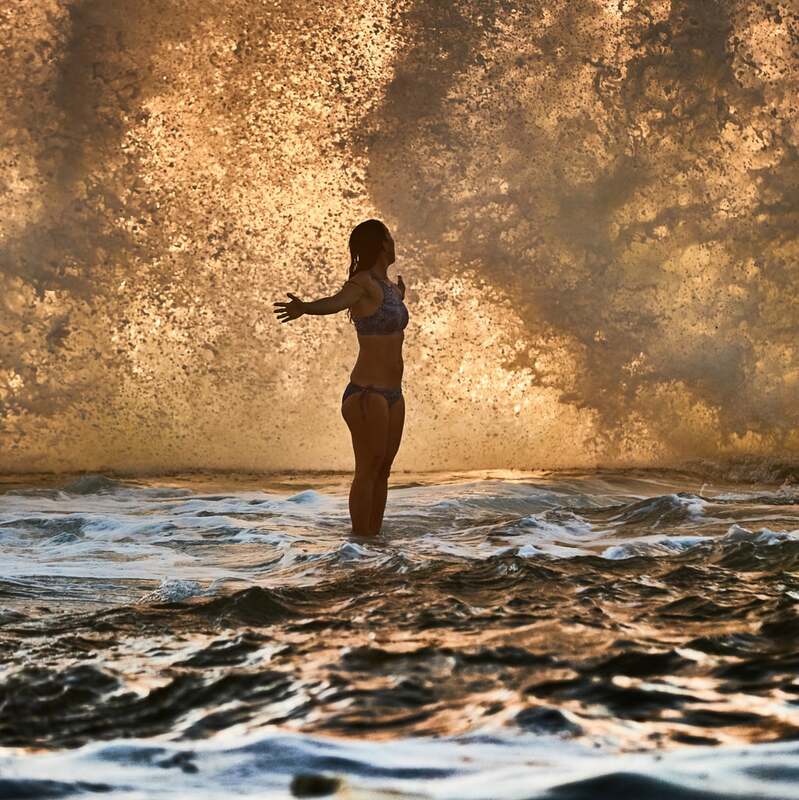 Through them, she's learned that women are just like the water she loves so much. "We are not conquerors, we do not need to break the spirit of the oceans. We are strong enough to recognize great beauty and infinite power, to appreciate and cultivate, protect and share. We are like water." Hanli says if you look out at the sea, it does not want for anything. "Is she waiting for somebody's approval or allowance? In a time when we see so much questioning of a young woman's value, so much self-doubt and low self-esteem, it is vitally important that women are given this chance to see themselves in water." Hanli is guided by an old saying: If you want to go fast, go alone. If you want to go far, go together. Hanli credits other women in her life for helping create opportunities and platforms for her to speak for the ocean. She cites support from a renowned philanthropy adviser in Switzerland, a highly committed board member in New York who constantly sees possibilities, and her best friend, Annelie, who shares energy and ideas. "I am privileged to have women who believe in me and the vision of I AM WATER," she said. Thanks to this experience, Hanli is guided by an old saying: If you want to go fast, go alone. If you want to go far, go together. Inspired by what you've just read about Athleta's partnership with I Am Water? Visit your local store to see how you can make waves in your local community. And learn more about the I Am Water Foundation and what it does to empower women and girls around the world.